I have four keyboards and I have defined Ctrl+1, Ctrl+2 and Ctrl+3 ... hot-keys for them. The problem is that either all of the hot-keys or the first one is removed regularly. For example every time the computer goes to sleep (or even locked) all of them are removed. I even tried other hot-keys (Ctrl+Shift+1, ... Ctrl+Shift+4) or (Alt+Shift+1, ... Alt+Shift+4) and the problem still exist. If I assign a transition key (Left Shift+Alt) it will work but that's not that useful when you have more than 2 keyboards and you want to regularly change the keyboard. 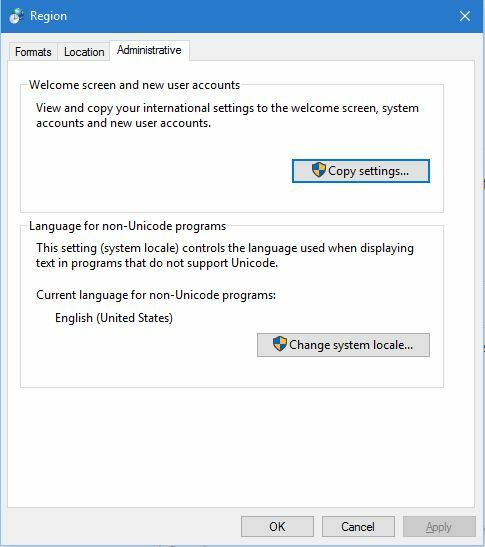 It appears that the problem has existed in Windows 8 too (and has something to do with welcome screen) but the solution I found does not work on Windows 10 (http://answers.microsoft.com/en-us/windows/forum/windows_8-desktop/custom-hotkeys-to-change-input-language-disappear/66d1d89d-e5dc-41e1-a8b3-48d596ab8e11). I finally found the solution and I am posting, in case someone else has the problem. 2- Search and find the "region" settings palette and go to administrative tab. Now go to "Copy Settings" section. Select both tick boxes below the window and press ok. In my case this applied the settings in a way that they are no more removed. Not the answer you're looking for? 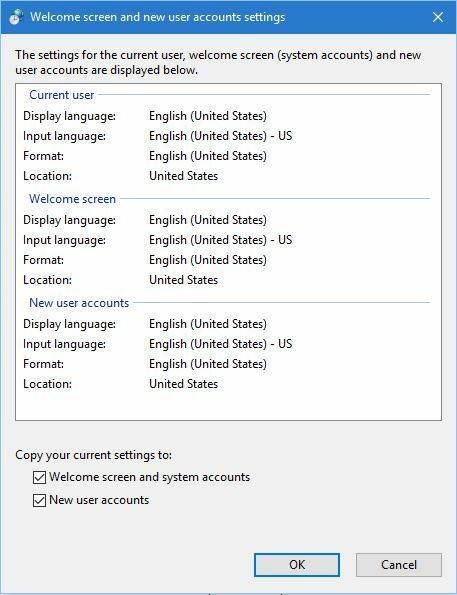 Browse other questions tagged windows-10 keyboard hotkeys input-languages or ask your own question.